Lyra Color Giants are in a class of their own, with highly pigmented, extra-thick 6.25 mm, break-resistant cores that last three times longer than regular colored pencils. Color Giant colors are brilliant, lightfast, smudgeproof, and waterproof. The hexagonal lacquered pencils come in a 12-pack of assorted colors and a six-pack of metallic colors. Set of 6 Metallic Colors — This set includes one each of the following colors, Metallic Brown, Metallic Yellow, Metallic Green, Metallic Lilac, Metallic Gold, and Metallic Silver. Set of 12 Assorted Colors — This set includes one each of the following colors, White, Lemon, Light Orange, Scarlet Lake, Pink Madder Lake, Light Flesh, Violet, Light Blue, Prussian blue, Sap Green, Venetian Red, and Black. Set of 18 Assorted Colors — This set includes one each of the following colors, White, Zinc Yellow, Lemon, Light Orange, Scarlet Lake, Light Carmine, Pink Madder Lake, Light Flesh, Violet, Light Blue, Prussian Blue, Sap Green, Apple Green, VanDyck Brown, Venetian Red, Black, Gold, and Silver. ™ Lyra is a trademark. 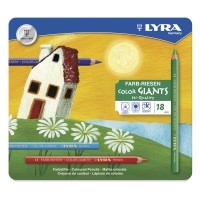 Lyra, a German brand acquired by FILA (Fabbrica Italiana Lapis e Affini) in 2008, has been producing superior-quality drawing implements since 1806. The excellence of Lyra pencils is recognized around the world by design experts, by professionals, and also by those using pencils for pleasure and amusement. Lyra pencils are a communicative and creative tool for artists of all ages.